Roxy Plagued by Annoying Phone Calls from "the Police"
Somehow I feel certain that the caller who bombards my Do Not Call registered home with his annoying phone calls, demanding to speak with Rex and mumbling something about donations to the Benevolent Policemen's Athletic Retirement Fund Scam, looks nothing like the hot cop in the photo to your left. He always refuses to send any information about his "charity" in the mail, and claims to be "exempt" from the Do Not Call registry. I've stopped answering the phone when I see the number on my CallerID, but I also note that sometimes the number dials our home as many as 10 times in a day. While we've been vacationing at our beach house in Bay Head, New Jersey, I found a new web site called AnnoyingCallers.com that allows people like me to easily find and share information about phone numbers used by harassing telemarketers and otherwise annoying callers. When we get back up north, I'm going to search the web site for user-submitted reports on the phone number that has been troubling us to find out whether they're bothering others, why they claim to be calling, and who is actually making the calls from that phone number. While I like to support our local police department and Roxiticus Valley area charities, I no longer listen to telephone solicitors, and request that they mail out further information about their charity to help me to make an informed decision. Clean Out the Closets...the Visiting Nurses Rummage Sale Starts Accepting Donations Saturday, September 6th! 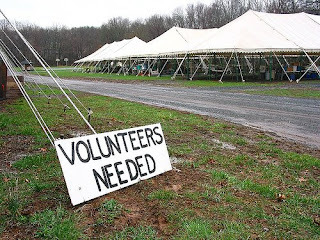 The famous VNA Rummage Sale, held every fall and spring at the Fairgrounds in Far Hills, New Jersey, is New Jersey's largest and oldest. Aunt Veg and Uncle Quiet Would Be Proud: More from the Sproutwells! After my militant vegetarian sister, Aunt Veg, and her husband, Uncle Quiet, visited our beach house in Bay Head, NJ, earlier this summer, I was inspired to post an episode of The Sproutwells, a typical fruit and veggie family living among humans, just trying to fit in with the rest of us meat-eaters. I got such raves that I've decided to post the latest episode, Daddy's Home. Mister Scott commented, "I finally got around to watching this video and realize now that I digs the Sproutwells... why can't there be cool stuff like this on tv?" So, for Mister Scott and the rest of you veggie power people out there, check out the new video and let me know what you think. This time, my favorite character is Rosey, the nosey neighbor. Click below to watch them sprout up! The Sproutwells have come to encourage us to join freshfunds, where we can all collect points and score great prizes with each purchase of healthy and fresh brands, Fresh Express and Chiquita. I've got my eye on this week's Fresh Funds auction item, a Nintendo Wii Fit...maybe a video game is just the thing to help me get in shape for the new "back to school" year. Rex, London, Maddie and I are out enjoying the evening on our screened in porch in Bay Head, New Jersey, and checking up on our newest neighbors. Three baby birds (I think they're robins) hatched on Thursday morning in a nest in the cherry tree right next to our porch. I was admiring them and hoping to take a picture for the blog, and Maddie remarked, "You love them as if they were yours!" London said, "What will you do when they fly away?" I told them it wouldn't be half as hard for me as it will be when London and Maddie fly away to college...but hey, I've got another 12 years! 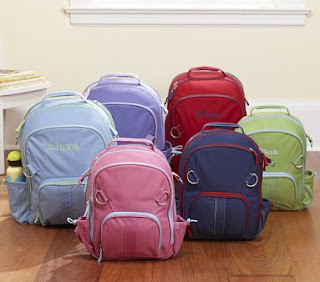 Since I was a kid dreading the end of summer, I've never liked the idea of "Back to School, " particularly the sale brochures that arrive in my mailbox in early July. 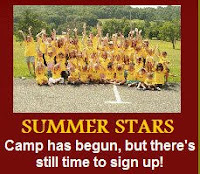 Now that I'm a mom, I still don't like it, but I have to face the reality that in six short days, Mendham Township Elementary School will open its doors to London and Maddie on Thursday, September 4th, and their after school activities will start the following week. Annie's Playhouse in Far Hills, New Jersey. It's midnight on Friday here at the beach in Bay Head, and that means that we can officially celebrate our best blogosphere buddy Mariuca's birthday, though I bet the party is well underway across the world. 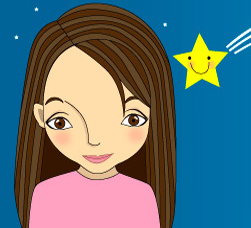 Of course, it's always the right time to stop by Mariuca's blog and leave her a gift or a birthday greeting! 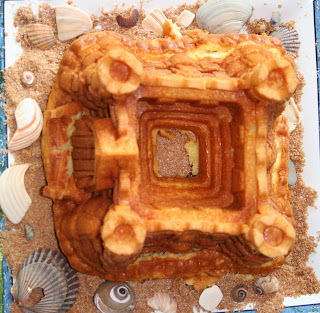 London, Maddie and I baked the Genie Princess a sandcastle cake, but we didn't know how many candles we should use. Make a wish, Mariuca!! Speaking of Lapdance Haircuts...Time for Back-to-School Victory Hair for Roxy, Rex, London & Maddie! Speaking of the strangest Google searches, it is still true that Roxiticus Desperate Housewives is number one for "lapdance haircut," thanks to the bizarre juxtoposition a few months back of a post about blogosphere buddy Deb on the Rocks, who uses the word lapdance on her EntreCard, and a post about my fabulous hairdresser, Madeline, who comes to my house every six weeks to create my Victory Hair... a special two-color blondest blonde and blondest strawberry highlighting process that gives me that unique look you've all come to know and love. Madeline and I go waaaay back, but she does NOT provide lapdance haircuts, not even for me. Madeline has been doing my haircuts and highlights for about 25 years, including those wild single years when Roxy and Melissa competed every weekend in the Ultimate Flirting Championship in each and every one of those cheap little seaside (Jersey Shore) bars. As a client once told me many years ago, everything changes when you have children, but Madeline will always be the source of Roxy's Victory Hair. As Labor Day is fast approaching, it is almost time for the Roxiticus Desperate Offspring to start the first and second grade at Mendham Township Elementary School, and they need back-to-school Victory Hair to start the school year right. On Tuesday morning, as we drive back up north after spending most of August at our beach house in Bay Head, we'll have the windows rolled down and I'll be singin' Tonight's the Night, since Madeline will be over for a visit in the evening... we'll drink a little wine, enjoy some girl talk, and by the end of the night, my hair will look ooh la la terrific. While my highlights are setting and I'm wearing tin foil on my head like a creature from outer space, Madeline will cut Rex's hair and give London and Maddie a trim, too. Then I'll read the girls a bedtime story, pack them off to their rooms, and SHAZZAM! One thing will lead to another with Rex, and there you have it...Victory Hair! As London would say, "Yay me!" For those of you who can't get a Victory Hair house call, Madeline works at The Edge in Landing, New Jersey and can be reached for an appointment at 973-398-3988. Just ask for Roxiticus Desperate Victory Hair: Roxy's special cut/style, the two color highlights, then maybe add a dash of Extreme Style by VO5 and you've got it... my secret's out! While You Were Sleeping....I Missed VIsitor Number 35,000! Visitor #35,002 came in from Madison, New Jersey via a Google search for "the looks of Bree from Desperate Housewives." I guess he or she didn't find it here, leaving after "0 seconds" which I think happens if you don't click on anything during your visit. Visitor #35,005 from Boston, Massachusetts and Visitor #35,012 from Union, New Jersey actually Googled "Roxiticus Desperate Housewives" but didn't stay long...wonder how we let them down? Are there some other Roxiticus Desperate Housewives I should know about? While Google webmaster tools can tell me my most popular searches, shouldn't they have a more judgmental category for "freakiest searches"? Just a reminder that Roxiticus Desperate Housewives is still number one for "lapdance haircut." Plenty of you came in via Entrecard, but so many referrals show up as "unknown" that I'll have to consider another method of observation...any suggestions? Roxy's Laptop Has Landed...but I Could Still Use a New One! As my loyal Roxiticus Desperate Housewives readers know, my HP Pavillion notebook crashed a couple of weeks ago, only a few hours after I wrote my "Sympathy for the Housewife" post introducing a new Roxy's Best Of... WordPress community of blogs. My notebook, a 320GB hard drive loaded with Windows Vista Ultimate and all the latest tools for investment banking and blogging, was only a little over a year old, so I was able to ship it back to HP in a pine box for service under my extended warranty. Of course, they made no warranty that I would ever see my precious data, documents and photos ever again, so I ended up buying a newer cheaper version of the same laptop right off the shelf over at Staples in Chester, NJ, and restoring most of my life (but you can never get it all back, and I'm still struggling to find myself) to the new PC. Good thing. Because Roxy's repaired laptop landed yesterday, and it's not quite the same. At all. I was sitting out on the screened-in porch at our beach house in Bay Head, New Jersey, and was delighted when the FedEx guy pulled up in his truck and handed my the huge package from HP. I ripped open the box, turned on my computer, and....a brand new shiny WELCOME screen labelled "test." All of my data...gone. All of my photos....gone. All of my preloaded Microsoft Office software...gone. Tabula rasa, a blank slate. I put it back in the box, hid it out of my sight under a desk in our home office, and hit the beach with Lynette, Susan, Rex, and all of our kids. Out of sight, out of mind. Meanwhile, Charter Communications is asking, "Could you use a new laptop?" and offering Charter Laptop-a-Day Giveaway with the promise of "30 Days, 30 Laptops, 30 Winners." The first winner will be announced on September 1st, with one winner a day for the rest of the month. 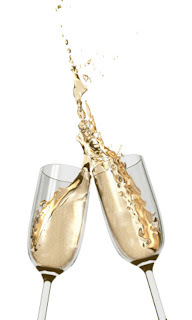 Plus everyone's a winner, as all online orders right now will also receive a Shell gas card valued up to $100. Charter is offering three great Back to School deals online – Charter High-Speed® Internet at $19.99 per month for 6 months, Charter Digital Home™ and High-Speed Internet at $69.98 per month for 6 months or Charter Digital Home™, High-Speed Internet, and Charter Telephone® at $99.97 per month for 12 months. We interrupt this vacation to bring you some exciting news...you're reading the 500th post to Roxiticus Desperate Housewives, and we're anticipating our 35,000th visitor today or tomorrow. As I write this post, the SiteMeter count is at 34,664....will you be the one? Wednesday morning update: Today's the day...we're up to 34,865. Earlier this month, we celebrated the third blogiversary of Roxiticus Desperate Housewives, and introduced the Roxy's Best Of... WordPress MU community. 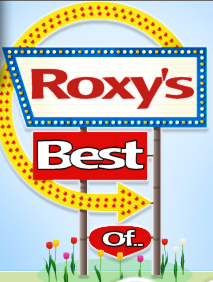 In the next day or so, we'll be introducing the first Roxy's Best Of.... blogs that are not written by Roxy, and I'll encourage any of you who'd like to post about your hometown to stop by Roxy's Best Of... and drop me a line with your proposal for a Roxy blog. As always, thank you for reading, commenting...and for coming back again and again! Now my loyal readers know that you can't take the Roxiticus Valley out of Roxy, and you can't take Roxy out of the Roxiticus Valley, except for weekends at our beach house in Bay Head, New Jersey. So Rex and I are not likely to be looking for a real estate agent to help find a house in San Antonio, Texas. However, our good blogosphere buddy LadyJava has been posting quite a bit lately about her plans to move, and Mariuca has posted about so many crazy adventures in her current apartment that she might want to consider relocation. I just wanted to let these Malaysian bloggers (and all of my readers) know that I can recommend a site that can help them to find a san antonio realtor if they'd like to move to the United States. The ClickSmart site I've linked here actually provides directories of certified experts, with all sorts of helpful links, such as contractors, florists and massage therapists...I wonder if they've got a link for lapdance haircuts? Apologies to my loyal Roxiticus Desperate Housewives readers, who may have noticed a decline in my prolific posting to this blog over the past couple of weeks. We're vacationing at our beach house in Bay Head, New Jersey, so please drop by Roxy's Best Of... Bay Head or the Bay Head Blog to keep track of our summer adventures. I'll also be posting some photos from last night's trip to Martell's Tiki Bar on the Boardwalk in Pt. Pleasant Beach, New Jersey to see our all-time favorite bar band, Southside Johnny and the Asbury Jukes! For those of you who stopped by to express your sympathy when my laptop crashed a couple weeks back, a quick update: the FedEx delivery man is due to return my (hopefully) repaired notebook to our beach house today...I'll keep you posted on what kind of shape it's in. Reader Poll: Is Roxy's Reader's Digest Syndrome Normal or Nuts? Remember back in June, when I participated in the six quirks meme and told you all about my quirks? A few days later, I realized that I have a seventh quirk that I like to call Reader's Digest Syndrome. I used to pick up the Reader's Digest in the bathroom when I was growin' up, and ever since I moved out of my parent's house after college in 1989, my mom has given me my very own subscription every year for my birthday, with some unexpected results that I call Reader's Digest Syndrome. For example, after reading several Reader's Digest articles about preventing the nightmare of identity theft, I now shred all of my mail...sometimes before reading it. I start to tell a joke, frequently forget the punchline, and then realize that the joke came from... you guessed it, the Reader's Digest! I'm still afraid of the bogeyman. When I was a kid I thought he lived in my family's cavelike basement. These days, I won't go down our basement (which is fully finished and brightly lit) at night. The bogeyman stays away when Rex is home, but when Rex travels on business, the girls sleep in my bedroom with the alarm system turned on. One time after a birthday party, some helium balloons set off the alarm system and the Mendham Township police force had to come and save us from the bogeyman! I have horrible, hideous fingernails, mostly my own fault. I bite them, I pick at them, and for several years I had a nail fungus (not my fault) that made ridges and bumps all over them. Eew! When I do any serious writing, I prefer handwriting to my computer. I carry a leather journal with me everywhere and write whenever and wherever I can. When I was living the wild single life, I carried a small notebook in my purse and wrote haiku in all the Jersey Shore bars. Despite my blogger persona, when I'm out and about "live" in the Roxiticus Valley (or anywhere else), I hide behind my camera and/or notebook rather than initiating conversation with new people. I've shown you mine, and at least six of you have shown me yours, although Henson doesn't really have any quirks...now we can all compare our quirks with the people who wrote in to ask the Reader's Digest's psychologists for advice in Are You Normal or Nuts? "I'm afraid to go to high places, like tall bridges or even the balcony at church. And it's not because I'm afraid I'll fall -- it's because I'm afraid I'll jump! I don't want to kill myself, but I do want to experience that sense of flying or floating. Of course, I know I'd go splat and die, so the desire to jump terrifies me. What do I do?" While the Reader's Digest's expert recommended facing that fear head-on -- "why not make skydiving a goal??!!" -- I think I'd rather follow my deejay hero Casey Kasem's long-running advice: "Keep your feet on the ground and keep reaching for the stars." I'm also a local mom (in Gladstone) and have read through portions of your blog - lots of fun commentary. I think it would be an ideal place to post information about a new PreK to 4th Grade school opening in Bernardsville, New Jersey. You may be familiar with the Cottage School in Peapack-Gladstone. Both of my children attend that school and love it. 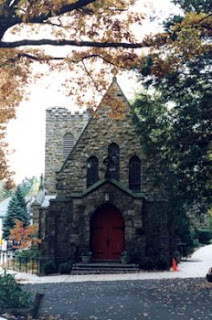 This additional school in Bernardsville is run by the same director (Laura Soulages) and is held in the St. Bernards church in Bernardsville. It is the location of a former Little Lamb program there. 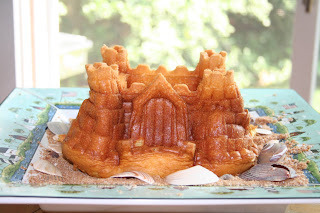 Please let me know if it is something you might add to your Bernardsville section of the blog. Since London and Maddie attend Mendham Township Elementary School and none of the other Roxiticus Desperate Offspring have any experience with The Cottage Schools, we can't offer you the Roxiticus Desperate Housekeeping Seal of Approval, but are happy to introduce The Cottage Schools and the new Pre-K through 4th Grade addition to our loyal readers...if you're a mom in the Greater Roxiticus Valley and you'd like to learn more about The Cottage Schools in Gladstone and Bernardsville, New Jersey, hop on over to Roxy's Best Of... Bernardsville to find the press release in its entirety. As my loyal Roxiticus Desperate Housewives readers know, Rex and I have a sweet deal in our household: he does all the cooking, and I do all the spreadsheets. The best part is that I am Rex's cooking muse, inspiring him with delicious ideas while I sit back and let him cook for me. Down here at the beach in Bay Head, New Jersey, my thoughts run to fresh shellfish and other seafood from the Crab Shack, on Mantoloking Road, across the bridge in Brick, NJ. My whole family enjoys the selection of domestic U.S. seafood -- fresh, local clams, shrimp, salmon, and other favorites. 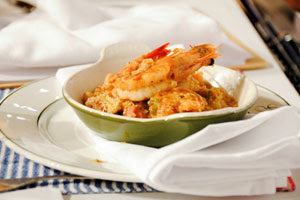 Today's inspiration hails from Louisiana -- a recipe I discovered on the Great American Seafood Cook Off web site. They've posted five finalists, who were given several challenges in creating their dishes for the final round of competition: each dish had to contain one of two mystery ingredients, either Southwest Airline Peanuts or select Michelob brews; keeping it healthy and simple, each dish’s ingredients had to represent all five food groups and be a dish that Rex and other home chefs could prepare on their own. All five dishes sound delicious, and I also feel confident that Rex could prepare any one of the five for me...but today Roxy's got a hankering for shrimp, so I've selected Chef Brian Landry's recipe for Shrimp and Andouille Cassoulet: Louisiana Shrimp and Andouille sausage smothered in a white bean casserole. I've teased you a bit and shared a tasty photo, and I'll let you in on Chef Landry's secret ingredient (see photo on your left), but I'm not going to post the entire recipe here...instead, you'll have to visit the Great American Seafood Cookoff at www.GreatAmericanSeafoodCookOff.com to download the complete recipe. While you're there, you can choose from the five finalists and vote for your favorite recipe, with the chance to win a trip to New Orleans. While I consumed my share of hurricanes during Mardi Gras with Melissa back in Roxy's wild single days, and I've taken clients to all of the best restaurants during a couple of NAB Radio conventions with Rex, we haven't been back since our girls were born, so I would love to win the trip....I wonder if London and Maddie are allowed in to Pat O'Briens? Hard at Work on Roxy's Best Of...Laguna Beach, California! If you've been wondering why you haven't seen my usual several posts per day here at Roxiticus Desperate Housewives, it's because I've been hard at work on my new Roxy's Best Of... WordPress MU (multi-user) Community. While dropping 300 EntreCards for Roxy's Best Of... for each of the past three days, I've learned how easy it is to get caught up in the "business of blogging" and forget that the content of daily posts is what keeps readers coming back. Today, I'm blogging from our beach house in Bay Head, New Jersey, but my subject is my favorite beach on the West Coast: Laguna Beach, California. For the past four years, Rex and I have taken London and Maddie out to California for every February school break to enjoy our favorite art galleries, restaurants, and shopping in Laguna Beach, and of course, Disneyland in Anaheim. Hope you'll all drop by and check out Roxy's faves! What the Heck Happened to Rex's Breitling Knock-Off? Better Get Him a Real Breitling Watch! Back around Father's Day 2008, my most loyal and attentive Roxiticus Desperate Housewives readers may remember that Rex broke his beloved Breitling knock-off wristwatch, and we sent it back to the shop for repairs. Well, here we are in August, and it is still missing. Meanwhile, I've discoverd an online store called The Watchery where London, Maddie and I can look through an incredible selection of real Breitling watches and find the perfect one for Rex. While we tend to lose track of time when we're vacationing at our beach house in Bay Head, New Jersey, it will soon be time to get back to school and back to business. Our investment banking firm has landed a couple of excellent new clients, so I'll be able to think about the real luxury of his and her Breitling watches for Rex and Roxy, maybe even in time for Christmas. The Watchery is the most discounted luxury watch site online, and right now they're having an end of summer sale. 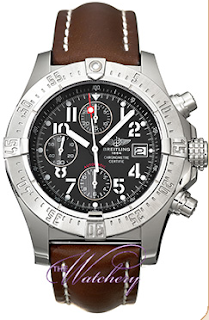 Check out the Breitling Avenger Skyland Men's Automatic Chronograph in the picture to your left. It has a polished stainless steel case with a brown leather watch band, lots of cool little sub-dials and the look that Rex likes best....and with the Watchery's low sale prices, I can get a sweet little ladies' Breitling Windrider Callistino for myself. 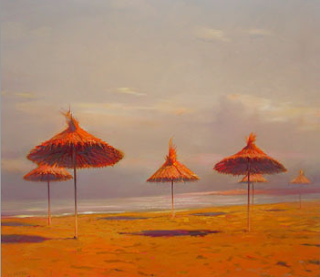 Pacific Edge Gallery has been a favorite since we bought our first Tom Swimm painting almost ten years ago. 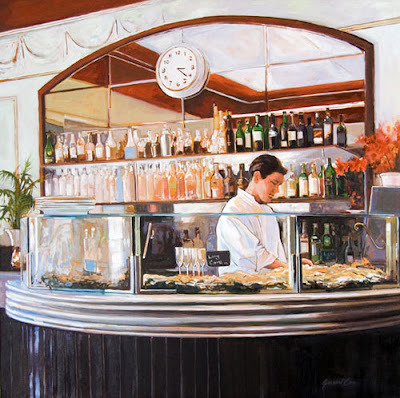 On this year's February break, we bought Oyster Bar (below) by Susan Cox and Rex found the perfect spot to hang it in our Roxiticus eat-in kitchen. Across the street is the William Merrill Gallery, which I find to be a more "sophisticated," New-York-style gallery. We don't own any of their artists, but perhaps it is just a matter of time (and wall space). I hope to take the girls to California one year in late July or August, in order to attend the Pageant of the Masters, a really cool event in Laguna Beach that I haven't been to in years, since we started our annual February break trips. The web site describes it as "ninety minutes of living pictures - incredibly faithful art re-creations of classical and contemporary works with real people posing to look exactly like their counterparts in the original pieces. An outdoor amphitheater, professional orchestra, original score, live narration, intricate sets, sophisticated lighting, expert staff, and hundreds of dedicated volunteers have won recognition for the Pageant as the best presentation of its kind." The first time I went, over 10 years ago, I was skeptical. I was picturing an Edward Hopper "painting" with a couple of actors hanging around a pool table, but the way to think about it is people as the pixels of the painting. Dinner at Sorrento Grille: Way too big delicious appetizers. The girls love the rack of lamb. We never save enough room for the Tin Roof Sundae dessert. The Studio and The Loft at the Montage. Despite the fabulous restaurants at the Montage, the Montage is actually away from town, in Laguna Niguel, so our favorite hotel is the Surf and Sand in Laguna Beach. Visit Luxury Link and get a nice low rate for a room in the tower with a full ocean view. Perhaps most importantly, it is right across the street from Koffee Klatch. Modern-Day Beach Blanket Bingo: London and Maddie Play Disney Bingo at the Beach! Back around the Fourth of July, Lynette and Tom and their twins came to visit us at our beach house in Bay Head, and complimented me (Mother of the Year, Mother of the Year) on how London and Maddie are too busy -- playing in the waves, painting seashells and selling them for 25 cents each (they hit their $125 target before the end of July and the Kit Kittredge treehouse, some assembly required, is hosting club meetings in our family room), and having wholesome outdoor family fun -- to waste their time watching TV at the beach. What Lynette doesn't know (and let's keep her in the dark while I do a little superior dance) is that, thanks to my ongoing battles with the Comcastic cable people down here, we don't have TV at the beach! So London and Maddie are counting on our digital video recorder back in the Roxiticus Valley to record all of the new episodes of Hannah Montana, Suite Life of Zack & Cody, and other Disney Channel favorites...I think we might even be missing the premiere of the third Cheetah Girls movie. Meanwhile, Rex trekked in to our New York City office for a client meeting earlier this week, and Brent slipped a package for me from IZEA into Rex's briefcase. When Rex arrived home, London and Maddie were delighted to discover....Disney Bingo! They quickly unpacked the box, popped the interactive family-friendly game DVD from ScreenLife Games into our TV, and looked forward to a visit from all their favorite animated Disney characters...Belle, Ariel, Cinderella, and all the Disney princesses, Mickey and Minnie Mouse, Snow White and the Seven Dwarves (Rex's favorite dwarf is SmartyPants)...even Cruella DeVille! Rex and I thought we'd grab some quality adult time on our porch while the girls tested out the game, but that turned out to be a mistake. Squeals of delight quickly turned to cries of "Mooooooooooommmmmmmmy!" as Maddie apparently broke the rules by changing Bingo patterns mid-game and London called her on it. Instead of relaxing on our porch with a bottle of wine, Rex and I should have remembered the importance of spending quality time with the entire family and achieved family harmony through Disney Bingo instead of letting it come to blows. Anyway, despite the "incident," when I later "interviewed" London and Maddie about their Disney Bingo experience, they both gave it a rave. Naturally, London liked it best when she won, and Maddie liked seeing all of her favorite animated Disney characters on the screen....both girls would like to put in a request to ScreenLife Games for a "live" character version of Disney Bingo that features Hannah Montana, Zack and Cody, the Cheetah Girls, the Jonas Brothers, and the gang from High School Musical. We've got a big week coming up at the beach, with another visit from Lynette and Tom and the twins, as well as Susan and Mike and their daughter. London and Maddie will be able to play Disney Bingo with all their friends, and if they enjoy it as much as my girls do, I'll know where to do my Christmas shopping...I can just go online to Amazon.com or Drugstore.com and stock up on Disney Bingo games! I found this test over on Penny Lane during a Battle of the Blogs and thought I'd test my 1930's housewife skills...I didn't know whether swearing like a sailor was a plus or a minus, but my score makes me feel just a little bit superior. My shiny new EntreCard is up and running on Roxy's Best Of...and the ads are currently cheap (4EC!!) for my first visitors/advertisers. Please "drop" on by Roxy's Best Of...and get in while the gettin' is good! I guess I should also take a moment, now that Roxy's EntreCard price is up to 128 EC, to encourage you all to contact me if you'd like to start your own Roxy's Best Of... blog as part of the Roxy WordPress MU (multi-user) Community. I've got New Jersey pretty well covered, and Matt Urdan over at MTMD has signed up for Michigan and North Carolina, but if you'd like to write about the best your hometown has to offer, do "drop in" to Roxy's Best Of and fill out the contact form to participate. Spammers need not apply. Aunt Veg and Uncle Quiet Have Left the Beach, But Here Come the Sproutwells! It's been a couple of weeks since my militant vegetarian sister, Aunt Veg, and her husband, Uncle Quiet, came to visit us here at the beach. However, the Sproutwells, your typical fruit and veggie family living among humans, are here at Roxiticus Desperate Housewives, trying to fit in to our world and entertaining us in the process. My favorite character is Ruby, the blond cucumber-looking character who reminds me of Aunt Veg...though the most shocking part of the episode involves Veggie dog and the Sproutwells' human neighbor. The Sproutwells have come to encourage us to join FreshFunds.com, where we can collect points and score great prizes with each purchase of fresh and healthy brands, Chiquita and Fresh Express. Click the video below to watch them sprout up! Sympathy for the Housewife or Windows Vista Jinx? Hard Drive Crash Put Roxiticus Desperate Housewives Out of Commission for Almost a Week! Mick Jagger says that weird things often happen to the Rolling Stones when they play "Sympathy for the Devil." And after posting "Sympathy for the Housewife," my introduction to Roxy's Best Of... at 3:30am on Tuesday, August 12th, I can tell you that weird, bad things happened to my PC. I went to sleep for four hours before waking up to take London and Maddie to Pavan's Tennis Academy at Fox Chase Tennis Club. When I got back to the house and tried to boot up my souped-up HP notebook, it was dead. I started to think I had jinxed myself with my "Please Don't Freeze" post about Windows Vista Small Business Assurance only three days before! After hours on the phone with various tech support people, the problem seems to be a horrifying blend of hardware and software issues ("serious display driver error," "unrecoverable system crash," to name a few of the kind messages Bill Gates' Dog has delivered). I've spent the past five days recovering my business and personal programs, documents, photos, and e-mail to a new PC. Yesterday, I laid my old computer to rest in a pine box and shipped it off to Hewlett-Packard. Who's got dinner for me? Please click on any of the links to explore my new Roxy's Best Of... WordPress MU Community, and do let me know what you think! Just as I was not planning to be in the market for a new computer but ended up with one anyway, Rex and I were not really planning to be in the market for a new SUV. However, our Jeep lease is ending on Halloween, and Jeep has decided to discontinue leases, only selling their new vehicles from now on. So Rex and I have started to shop around for an SUV that we can lease and return after three years instead of owning it forever. I'm guessing it's a "guy thing," but I don't really pay much attention to other people's vehicles, and Rex does. I'm therefore a bit behind the curve when it comes to choosing a new one, and Rex has been good about pointing out the other SUVs he thinks we should consider when he sees one on the road...zooming past us on the Garden State Parkway, parked on the street in Bay Head, etc. On the other hand, I spend much more time than Rex does out and about in the blogosphere, and I came across this funny video that features Zara Phillips, the first British royal in direct line to the throne to appear in an advertisement, Horsing Around as the new face Land Rover. Click on the video below to laugh with me as Zara leads her horse from its trailer near a soccer field, heating up some footballers, including one "Jack the Lad" who tries on some terrible one liners and gets more than he bargained for from both Zara and her horse. The Black River Music and Art Fest, coming to Chester, New Jersey on Saturday, August 16th, is a FREE all day event featuring some of the best local original musical acts as well as numerous visual artists displaying their work. Last year’s event drew an estimated 9,000 people, and they're expecting an even bigger turnout at this year's Black River Festival. Date(s): This year's event will take place on Saturday, August 16, 2008, with a rain date of Sunday, August 17th. I've joked with my loyal Roxiticus Desperate Housewives readers about not being Mother of the Year material (in fact, my older daughter did present me with my very own "Mother of the Year" award in front of her first grade class around Mother's Day this year), but I feel like we all do our best to raise our kids...instilling values like gratitude and graciousness, perhaps best expressed as a young child by sending thank you notes for gifts. Unfortunately, the road to hell is paved with good intentions, and Roxy is known around our household (okay, okay, around the whole Roxiticus Valley) as a bit of a procrastinator. Maddie's sixth birthday party was back in the middle of March, and we had an amazing ballet party featuring Miss Katie from Garden State Ballet and about thirty little girls in tutus in our basement. 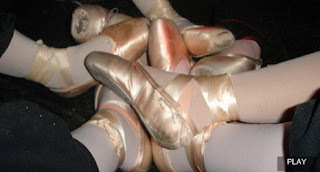 I took many pictures of each girl -- every plie, sote, grand jete, tondue and arabesque was captured on film. I started down the righteous path by ordering the full Hannah Montana Party Pack of plates, pinata, party favors and thank you notes. I took note of each gift as Maddie unwrapped it. No more than a week after the party, Maddie painstakingly wrote out a personal thank you note to each little girl. I ordered copies of the photos online and made plans to sort through them and mail them out as part of each guest's thank you packet. And then? I ran out of address labels and didn't get out to Staples before Rex's surgery and our spring break in April, and I couldn't figure out how to get the funny-size envelopes into our printer (and besides, we had already stuffed them with thank you notes and photos). I started to wish I had one of those personalized rubber address stamps, but didn't go to the trouble of ordering one online. So, five months later, I think the cost of postage has gone up, and here we sit with Maddie's unmailed thank you notes. The good news for a procrastinator like me is that Vista Print online is offering 50% off small rubber stamps (use coupon code Stamps50), or 50% off return address labels (use coupon code Labels50). So, if you're one of those Roxiticus Desperate Housewives whose little ballerina is waiting patiently for a thank you note from Maddie while you question Maddie's upbringing, I have six key words for you: "Your card is in the mail!" And you'll have it before they start the first grade in September.